How do you keep track of where you are at while reading a book: do you use a book mark, dog ear the page, insert a pencil, put the open book upside down, or do you have your own original way of keeping track of where to start reading again? My books look much loved and well used :) That also means some dog ears here and there! Bookmarks are a pain, they keep getting lost and falling out. Ebooks have no character, the ereader apps all automatically keep track of where you were last! As a book collector, I would never dog ear a page. Books are "sacred" to me and I do not deface them in any way. I have some beautifull antique children's books with illustrations as well as many other books. I always use a book mark and have several different types. I love those magnetic bookmarks, they are fantastic! They make sure you don't lose your place and they don't fall out meaning you can take your book with you everywhere. You can get them at most book stores or online. I use a bookmark. I would never dog ear a book, that is like vandalism to me. I'm with you on that one, Bryony. As a frequent traveller (not necessarily flyer), I find unusual bookmarks are great souvenirs for myself and friends. They are light and easy to pack. I don't dog ear books (well, not on purpose anyway) and I'd get a bit cranky if someone did it to one of my books. I use bookmarks, but I'm not really attached to any particular one. I used to use bus tickets. Now we don't have paper tickets it's often receipts or envelopes. I normally use bookmarks and also note which page i am on and it's easy for me to find my way if i drop the book or accidentally close the book. I used to keep them all pristine but now I just dogear...when we moved house, I had to give away about 3000 books to charity shops so I just thought what's the point of being so precious about them. I am a little thingy about the comics tho - I keep those in pristine condition. Rather bookmarks than dog ears; just can't stand the idea of being the creator of potential damage to the book. 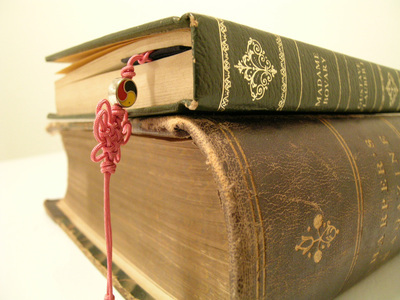 I prefer to use bookmarks, I don't like my books to show too many signs of wear and tear. I always use a bookmark, I wouldn't damage a book by dog-earing a page, however, the bookmarks I use are rarely actual bookmarks. I usually use a receipt, or a bill if there is one lying on the table. I've been known to use my cell phone, my laptop, a tissue paper (clean of course) and on occasion, I've used another book. I use bookmarks, however I do dog-ear parts that I may want to look at later, ie for references, or if I've noticed a spelling or grammatical error....haha! A bookmark. You never dog ear a page and ruin a good book. Books have feelings you know and should be treated kindly. I've very many lovely bookmarks I've collected over the years'. Any spare I give to local Library for their 'stay at home' readers'. I always kept spares too, in my work bags, & give them to people on the train, if I saw them ready to 'dog ear' a book! 'Greeting Cards' make beautiful bookmarks! Mistreatment of a book is anaethema to me. My parents' bought me many books, & taught me how to look after them. I love looking at my books in my Lounge Library, as they mean so much to me, on their varying subjects! They're admired by visitors', too. I use a bookmark, receipt, scrap of paper, or pretty much whatever I have on hand to keep track of where I'm up to in books. I've even used the paper tag from a teabag once! Do you lend books to friends? Have you read The Prophet by Kahlil Gibran? Do you always remember the storyline of a book you have read? Do you know the words to your country's national anthem? What is the best feature of a Chinese garden? Best activity in the Dandenong Ranges?